Why Does My Company Need Video Analytics? Are you guilty of creating a beautiful video, uploading it on social platforms, and … forgetting about it? You’ll look at the number of views and comments it got, or even go as far as to rejoice at the amount of shares it received. But that’s the extent of your video ‘data’. Then you move to the next video. And the next one. And the one after that. If you’re not tracking your video campaign data, you’re missing out on massive opportunities to drive action through video. If you cannot measure your video’s performance, how do you improve, optimise, and get better results through it? We’re living in a video-first world. 51% of marketers name video as the type of content with the best ROI and it drives a 157% increase in organic traffic from search engines. So, each video in your campaign should be a cut above the previous one and get better results, faster. But What is Video "Data"? Gives you insight on who your viewers are (demographics, interests, social activity). How popular your content is with them. Helps you create videos that drive more conversions and increase engagement. Figure out which video campaigns are working and which ones should be abandoned ASAP. Helps in determining and spending video marketing budget effectively. In short, it is the crux of video marketing upon which other strategies are built and implemented. The key is to create a video campaign and workflow that is supported and lead by data. 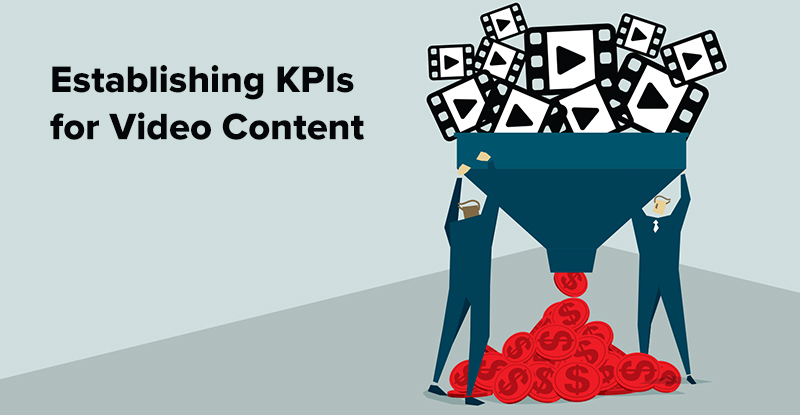 What Metrics Should I Use For a Data-Driven Video Strategy? Video marketing analytics isn’t as labyrinthine as it may sound. It’s actually quite simple, and with the amount of amazing video analytic tools at our disposal, the process barely takes much time or effort. It’s all automated and comes in a neat little spreadsheet or web page. Let’s discuss some common video metrics you should consider monitoring. The number of times your video was viewed. This can be measured differently across different distribution channels. For example, Facebook counts the first 3 seconds of viewing as a full 'view' of the video, while other channels count a view as taking place from 10 seconds onwards. Also known as ‘watch time’, it tells you the amount of time viewers spent watching your video. The higher this metric is, the higher overall viewing session that video has. How long viewers spent watching your video on average. This is a powerful metric that lets you in your audience’s preferred time length for videos. The amount of people that clicked on your CTA, or Call to Action (i.e the action you want viewers to take via this video; subscribe to email list, buy a product/service, visit your website, etc.). Well, we’re all a little fond of tracking this vanity metric, aren’t we? Engagement tells you the amount of shares, comments, and likes your video received. This is where you find out more about who’s viewing your videos. Their demographic, geographical location, and so on. Percentage of people who clicked play on your video. It determines how well the video is integrated with the site or the platform it’s hosted on. Not all analytics are created equal, and not all need to be monitored depending on the goals for each particular type of video you create. Our full series on the Video Sales Funnel spells out exactly what videos you need at what points in your customers sales journey, as well as the metrics you need to monitor for each type. Effortlessly publish your videos from Wipster to any of the leading distribution channels and let the HealthScore aggregate analytics and crunch them down into one clear visual. To create a video marketing strategy that works, you need to stay on top of your video analytics. In today’s video-first world, it's a must. Wipster truly believes that data-driven video strategy is the only kind that drives significant results. Wipster helps creative and marketing teams create better video, faster by providing a seamless video workflow, from creative review and approval, through to publishing, analytics, and content iteration – all on one platform. Mark Boszko is an in-house video producer at The Omni Group, makers of fine Mac and iOS productivity software. Mark has worked across the industry and has been hooked on filmmaking since age five. He is inspired by a vast array of online resources and industry professionals. We were fortunate to sit down with Mark to better understand his thoughts on the importance of video, his video review and approval workflow, and the future of video. Karl Drury is an in-house video producer at Xero. He films marketing material, case studies, internal videos for staff, and pieces for Xero TV. We were fortunate to sit down with Karl to better understand his thoughts on the importance of video, the differences between freelance and in-house video production, and his video review and approval workflow. Video is his life, and is rarely without a camera in hand. We recently caught up with Verity Mackintosh, executive producer of Graci in the Kitchen, cooking show with a deliciously simple premise.